After much tossing and turning, I was finally able to sleep soundly around 4am. I awoke around 8am, wondering what time we would be heading out, and where we’ll go for breakfast. Vincent went out of his room around 9am, and by 10am, we were heading out his apartment. Vincent told me about this festival that they were having that Sunday. It was an old tradition of celebrating the safe journey and return of the fishermen from the sea. Luckily, it was being held nearby. 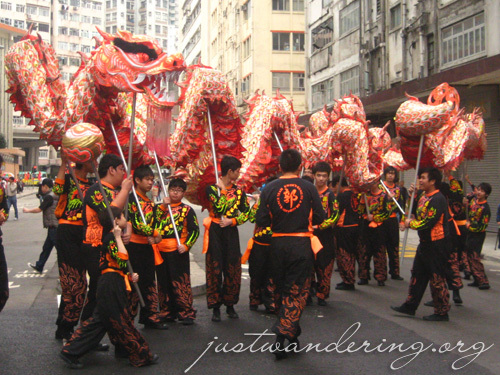 Just on the other side of the Tai Kok Tsui Municipal Services Building, locals and tourist alike are out in the streets, looking at the various contingents waiting for the opening ceremony. 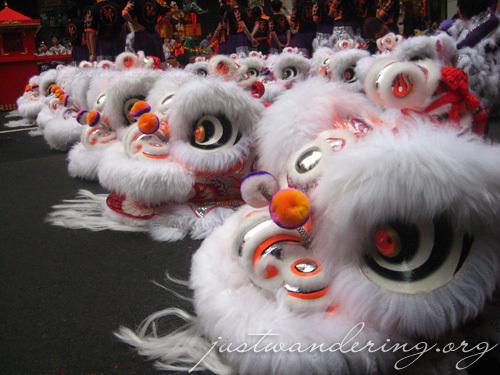 We ogled the fancy costumes and took pictures of the participants, much like what we would usually do when we go to festivals in the Philippines. There were several stalls as well, selling locally made products. What took my fancy was this stall selling “handly flour doll” — handmade cellphone charms made in the likeness of the twelve Chinese zodiac and anime characters. As much as I was charmed by the goods and the costumes, my tummy was rumbling. We didn’t have any dinner, and I don’t think Vincent has any plans of having breakfast. I asked Vincent if there are any places where we can get anything to eat. He seemed incredulous that I wanted to eat, since we were going on a buffet for lunch. I said I wanted to have something to tide me over until then. We went inside the municipal building, where there’s a food court. Unfortunately, the stalls are still setting up, and nobody was serving anything yet. We went back down and he pointed to a newspaper stall selling chips and candies. Uh, no. Finally, he guided me to the other entrance where there was a Mc Donald’s across the street. He gave me instructions to just meet him back at the library inside the municipal building. I crossed the street and went the opposite direction of McDonald’s. I’m in Hong Kong! I’m not going to McDonald’s for a breakfast muffin! I ended up in a local convenience store, and bought a beef ball. It was so good. It felt great to have something in my stomach. I made my way back to the municipal building, and as I was entering the library, I ran into Mandy, who was going to McDonald’s for some coffee. I went back down with her, and after my initial reaction at the prospect of eating at Mc Donald’s I ended up with a Sausage McMuffin (I actually got ham, but I didn’t see the sandwich until we were back at the building). When we went back to the street where the festival was taking place, the program has started, and the contingents were already parading. It was rather short, as they had to dismantle the stage before the contingents can perform their dances. We didn’t want to wait, so Vincent and I went off to the Japanese restaurant where we were having lunch. Mandy and Tim wanted to explore on their own, so we agreed to just meet after lunch. Yes, you read that right, we were having lunch at a Japanese restaurant. Vincent was so gung-ho about this restaurant when I arrived the night before. Eager to make a positive impression on my host (and because I am a weakling), I relented and agreed to go to a Japanese restaurant and eat Japanese food while in Hong Kong. 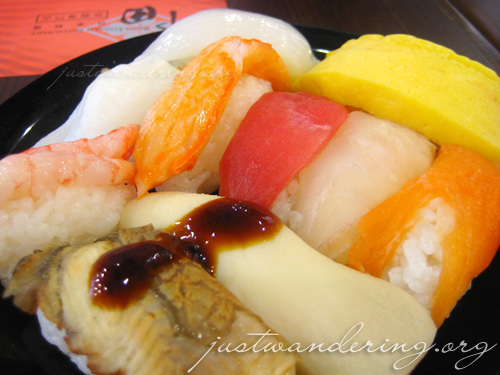 The Roda Japanese restaurant is very popular among the locals. I was probably the only tourist there — and it was easy to see why. 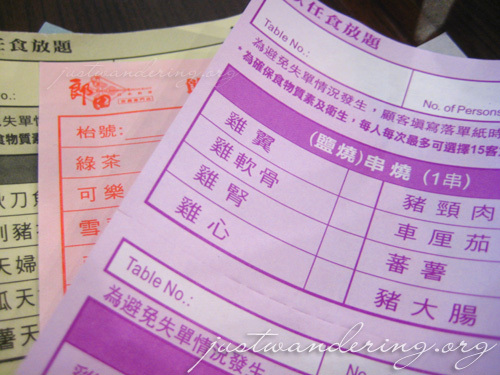 The menu is in Cantonese, and the menu card, where you have to place your orders are all in Cantonese. The restaurants has an all you can eat buffet, and you can just order anything you want in the order slips. The day before I left Manila, I was supposed to meet with some friends for a sushi dinner at (in our opinion) the best sushi restaurant in Manila: Seryna. Unfortunately, I overslept and wasn’t able to make it for lunch. That’s why when Vincent proposed a Japanese all-you-can eat lunch, I was easily persuaded. Sorry to say that the quality of the sushi and the other dishes served at Roda Japanese Restaurant wasn’t at par with the food you can eat at Little Tokyo in Makati. I just consoled myself with several helpings of salmon sashimi, crab cakes and shrimp tempura. For HK$200 (the amount Vincent said I have to shell out), it was a sub par lunch. At 3 o’clock, we met up with the Belgians at the Olympic Mall. We arrived almost at the same time and we went out to the bus terminal right beside the mall. We got on bus 16, and got the front seats on the double decker bus. I love riding double decker buses. Well, I like riding buses in other countries. It lets you see different aspects of the city that you wouldn’t see when you’re walking or when you’re inside a car or a train. It was interesting to see how many people were out on the streets. We were soon out of the commercial center and was headed east. Though the are is now mostly residential, there was still plenty of sky scrapers all around. After riding for almost an hour, we got off at the entrance of Pleasure Garden. There were skyscrapers to our right and to our left, a hill looms. It turns out we were climbing this hill. Luckily, I was wearing my trainers and my comfortable clothes, else it’d be hell. 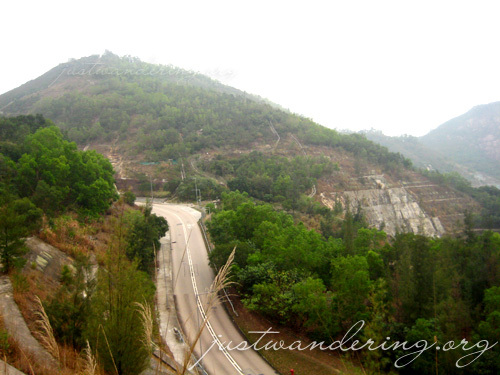 It was as if I was back in Coron, climbing Mount Tapyas. There were stairs going up, and it seemed to go on forever. 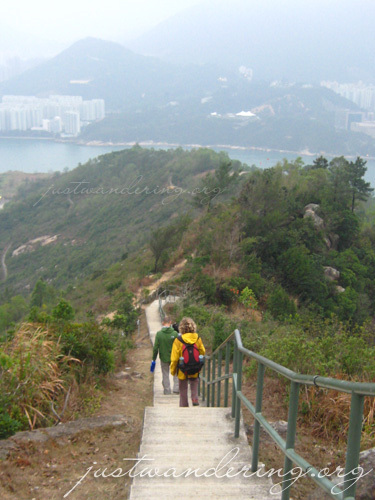 before we reached the top though, we veered off and followed a trail that run along the hillside. It was rather surreal. 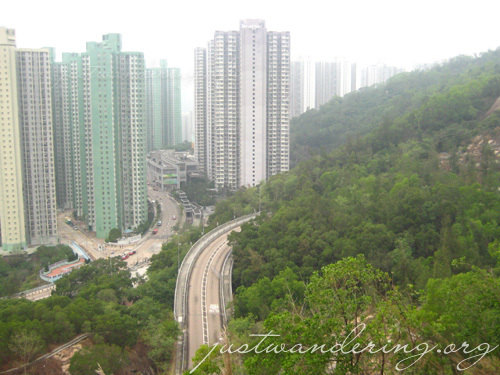 There were foliage all around and you can hear birds chirping — sights and sounds you wouldn’t associate with HK. Hiking the Wilson Trail was actually fairly easy. Apart from the climbing, it was generally pleasant, as the trail is paved and there were benches where you can rest and catch your breath while you enjoy the view. We walked and walked and walked. During one of our particular stop, I overhear Vincent telling Tim that we were going down. I instantly perked up. Tim asked me how I was doing, as I was trailing behind them all the time. I said I was okay, and was invigorated after hearing the magic words. He laughingly told me that we were going down, but we’d have to go up another peak first, and he pointed to this mountain in the distance. See that mountain in the distance? That’s where we’re going. We continued walking, and soon we were on a trail where there aren’t any side rails. It was just a paved path on the side of the mountain that was rather terrifying because if you missed a step, there’s a huge possibility that you will roll down the side of the hill and into the road. We went up again and as I crested the peak, I was surprised to see a badminton court. That’s one hell of a warm up going to that court. The trail was all downhill from there, and I was looking forward to going back to ground level. We reached the street and Vincent kept on walking. I thought we were walking to the bus stop, but it turns out, he was just walking to the continuation of the Wilson Trail. Mountains on the right, skyscrapers on the left. It was all uphill again, this time it was higher than the climb at Pleasure Garden. The path evened out, and it was another pleasant walk high up the side of a mountain. We soon came upon some shrine. We took pictures and we walked out to the ledge to look at the view of the harbour. We were surprised that it was part of a HUGE cemetery. 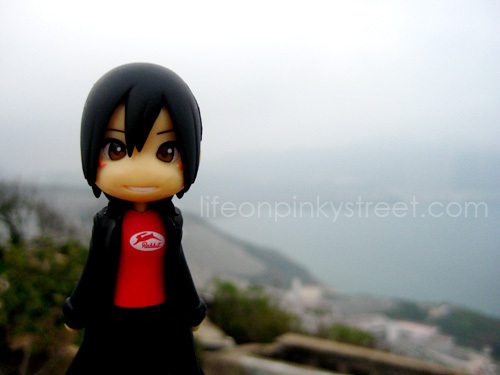 There were shrines all over the side of the mountain with this gorgeous view of the Hong Kong Harbour. 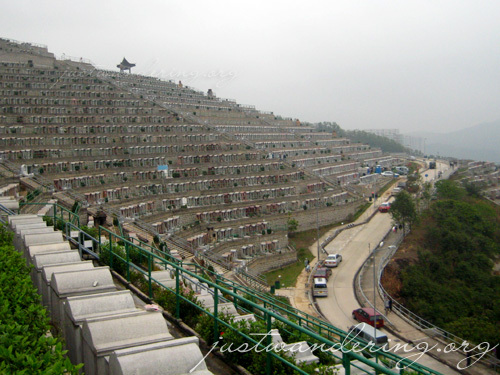 After taking photos, we went back to the trail, still amazed with the huge cemetery. Then Vincent went off the trail and started climbing up this unpaved path up the mountain. Climbing stairs was fine with me, but climbing up a path without any distinct markers was rather unsettling, specially if my companions are all way ahead of me. I soon found myself alone, and came upon a fork on the path. Nobody was in sight, and I’ve no idea which fork to take. I decided to take the one that looked easier, and after several steps, I still couldn’t see Vincent, Mandy or Tim. I contemplated what to do. Do I continue? What if I can’t find them? Luckily, another hiker came up then and took the path that I didn’t take. It turns out that both path meet up at the same point, so I was still on the right trail. I heaved a sigh of relief and continued climbing. Soon enough, I saw this fort at the peak of the mountain, and Tim and Mandy waiting for me. Ironically, there was a sign welcoming me at the end of the path. No entry, it said. Awesome. You’d have to clamber up to the fort from the path, and Tim and Mandy was waiting there so they can help me up. I was able to climb up on my own, but I appreciated their gesture of waiting for me there, unlike our host who was relaxing somewhere in the fort. It was called Devil’s Peak, and the fort has a great vantage point of the harbour’s entrance. The view was spectacular, but with the thick fog, it was pretty hard to appreciate it. We made our way down a paved path and it was all downhill from there. 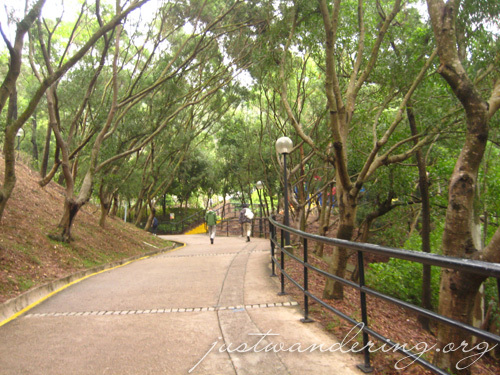 We were back at the Wilson Trial, and soon, we were on the private road that leads up to the Tseung Kwan O Chinese Permanent Cemetery. We emerged on a main road, and there was a bus terminal and a MTR station. We took the train at Yau Tong to Mongkok, where we transferred to a train going to the Tsim Tsa Tsui station. We made our way to the Victoria Harbour waterfront near the Star Ferry terminal where we will watch the Symphony of Lights. The show starts at 8pm, and we arrived around 7:30pm. There were already plenty of people milling around, and we were able to get good seats before the place filled up. The Symphony of Lights is a nightly show, with narrations alternating between English, Mandarin and Cantonese. 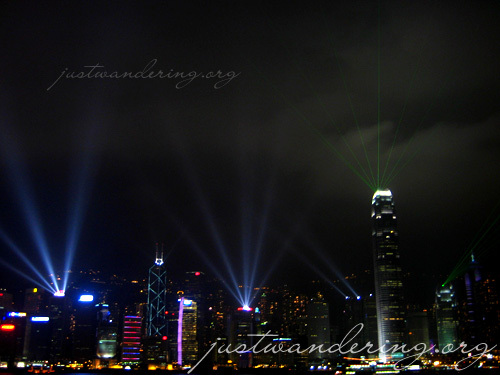 Basically, it’s a light show, featuring the buildings on Hong Kong Island. The show was only 10 minutes long, and after the show, we went back to the apartment for more beer and conversation. We were all exhausted, but we were still able to talk and share photos until 2 in the morning. I bid them goodbye before we turned off the lights. I was leaving early the following morning. 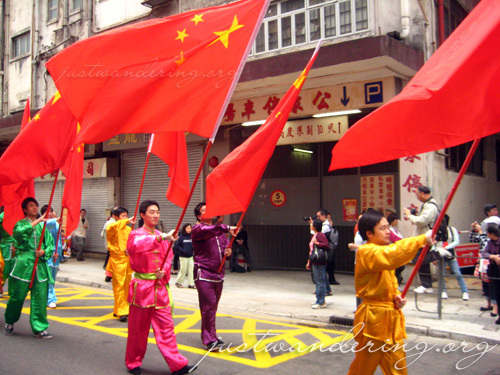 this part of hong kong is what i really want to see. so beautiful. the roast is a must when you’re in HK. my fave would be the roast goose and pigeon. 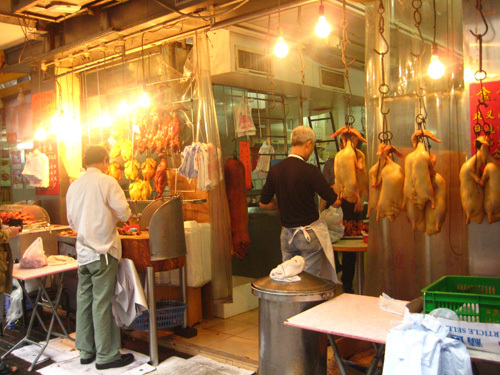 the best pigeon I’ve tasted is at the ferry terminal that will take you to macau. wow, inggit naman ako. tapusin ko muna ang philippine tour ko. nice photos and nice travel blog. The Symphony of Lights was THE one thing I missed when I was there! I missed the taste of roast too! It was my favorite back in Prince Edwards. I would take home roast with steamed rice and soup for me and my bestfriend. A single order was only 10 HKD then. Kasama na yong rice at soup non. Sarap talaga lalo pag winter time!